Located in the heart of Lucknow's prime Central Business District, this center is fully furnished and equipped with everything needed to be up and running instantly. There is a dedicated front desk staff to take care of business needs and the center is committed to providing a low-cost business running space. With A1 location, high standard and service, and imaged building, it is the first priority for entrepreneur choosing. Attracting so many international corporations, luxury fashion brands and renowned restaurants located here. This new center encompasses a vibrant downtown which redefines Lucknow's city skyline, setting a new standard for urban living. We offer complete business center packages which can be tailored to your needs. Your business should have the best; this property will increase your credibility and revenue at very little cost. 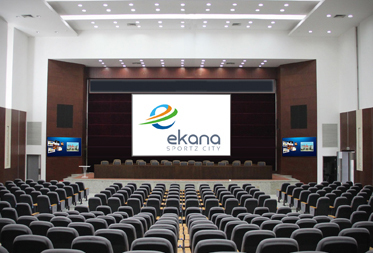 Ekana is here to cater to all your business and meeting needs.